Pyongyang’s statement on Tuesday did not mention a parade, but it said that the North would “significantly mark” the new Army Building Day with “diverse events” every year. The South Korean Defense Ministry said on Tuesday that it was closely monitoring signs that the North might be planning a parade. If held, a military parade would be the North’s first since Mr. Kim claimed on New Year’s Day that the country had finished building a nuclear force, including missiles capable of reaching the mainland United States. Rolling out the country’s new intercontinental ballistic missiles, or ICBMs, during a parade would keep the North’s nuclear threat in the spotlight amid the celebrations surrounding the Games, analysts said. “It can keep its people from looking enviously at the Olympics in the South, rallying the loyalty of its people and officials by reminding them that although the North may lag behind the South economically, it is ahead of South Korea militarily,” said Cheong Seong-chang, a senior analyst at the Sejong Institute in South Korea. North Korea, which before this month had not expressed interest in joining the Olympics in the city of Pyeongchang, plans to send 22 athletes, along with hundreds of musicians, dancers and cheerleaders. The two Koreas have agreed that their athletes will march together at the opening ceremony with a single flag symbolizing a unified Korea. They will also field the first unified Korean team in the Olympics, a women’s ice hockey team. Pyongyang residents on Monday after practicing for a mass rally. 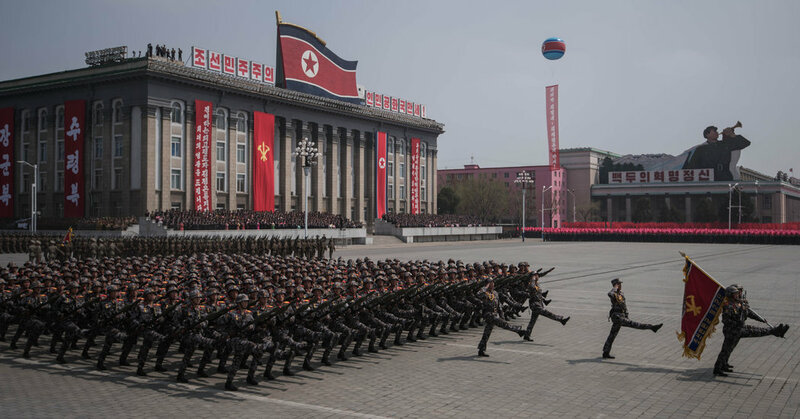 North Korea has made no announcement about holding a military parade, but South Korean officials say they have observed signs of planning for one. On Tuesday, a team of South Korean officials went to the North for logistical preparations at tourist and ski resorts where the two sides have agreed to hold pre-Olympic cultural events and train non-Olympic skiers together. A team of North Korean officials finished a similar trip to the South on Monday, to review potential venues for performances by North Korean artists. Mr. Moon’s office addressed the criticism on Tuesday, calling for the nation to unite in favor of a successful Games. “We don’t understand why they label the Games the ‘Pyongyang Olympics,’” Park Soo-hyun, a presidential spokesman, said in a televised statement. Rather, he said, they should be called the Pyeonghwa, or peace, Olympics. “If these traitors and psychopaths defaming the dignified Korean nation are allowed to go scot free, the national reconciliation, unity and the building of a reunified powerful country will be delayed so much,” said a statement carried by the Korean Central News Agency. Japan’s foreign minister, Taro Kono, said on Tuesday that the talks with North Korea over the Olympics would not lead to a softening of international resolve against Pyongyang’s nuclear program. He said the North had a track record of engaging in dialogue only to disregard any agreements and continue its pursuit of nuclear arms. Elon Musk and Tesla Resolved One Issue. Now for the Rest. August 27, 2018 Comments Off on Elon Musk and Tesla Resolved One Issue. Now for the Rest.